Healthy high calorie diets are often necessary to supply adequate nutrition for athletes and people trying to gain weight. However, it's still important to make healthy choices as you boost your calorie intake. If you've been placed on a high calorie diet, it's important to understand there is a difference between high calories in general and a healthy high calorie diet. For those who follow a calorie restricted diet to maintain or lose weight, hearing that someone needs to eat a high calorie diet fills their head with ideas of eating all the fried chicken, ice cream and starches they want. While eating like this would be high calorie, it definitely would not be a healthy high calorie diet. The rules about what is healthy and what is not don't change based on the number of calories you eat. Whether you're dieting to lose weight, or trying to gain weight, some foods are good for you and others are not. The temptation for some people on a high calorie diet is to fill up on calorie dense foods high in fat, but a healthy approach will steer clear of unhealthy fats. To do this, a healthy diet avoids foods that contain trans fats and limits the intake of saturated fats. Diets high in such fats have been shown to increase the risk of coronary heart disease. Fat is calorie dense and provides nine calories per one gram. By comparison, one gram of protein or carbohydrate is only four calories. 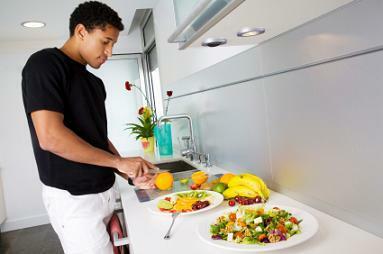 A high-calorie diet should still be a balanced diet to be healthy. Beans: Legumes such as black beans, black-eyed peas, kidney, pinto and others are rich sources of protein. In fact, one-half cup provides as much protein as you'll get in three ounces of steak! Not only that, but they are a great source of fiber. Beef: While healthy diets tend to steer us away from red meant, lean beef only holds one more gram of saturated fat than a chicken breast with the skin removed. Along with that, beef is also a good source of B12, iron, and zinc. Eggs: The reason eggs are avoided in many diets is because they are high in cholesterol. One large egg provides a little more than 70 percent of what you need in a day. To incorporate eggs without the yolk in your diet and still have taste, you can use the egg whites of two large eggs and add two teaspoons of unsaturated oil to the mix, or you can purchase an egg replacement such as Egg Beaters. If you do choose to eat the entire egg, yolk and all, on those days it is wise to watch your intake of cholesterol for the rest of the day. Poultry: White meat is best because it is a good source of lean protein. The dark meat is higher in fat, and the skin should be avoided all together. Carbs found in whole grain products, fruits and vegetables should also be incorporated in a healthy diet. If your doctor has placed you on a high calorie diet, talk to him about how to balance the calories you take in. A healthy meal plan will include carbohydrates, protein, healthy fats and plenty of water. Balance is important, even when you boost your calorie intake to gain weight.